” The National Congress of Australia’s First Peoples has also warned that a focus on “economic prosperity” in the current Close the Gap review “is misguided and should not serve as an overarching focus for government policy”. 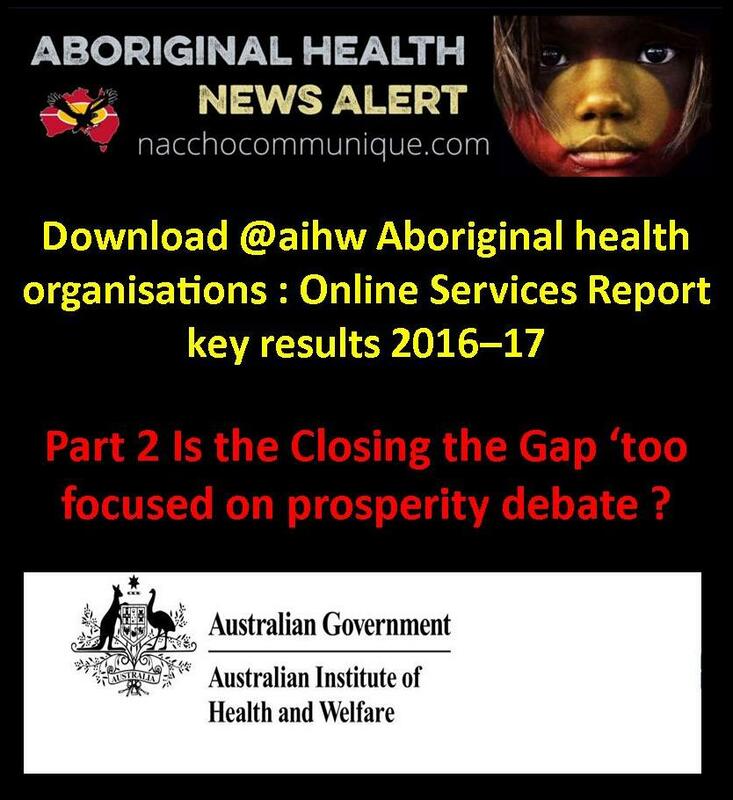 The Lowitja Institute has called for “prosperity” to be ­removed as a criteria, saying it “has strong monetary connotations and does not adequately speak to the health and education sectors”, and warns that the ­review will fail “if effective partnerships and engagement, not consultation, with Aboriginal and Torres Strait Islander leaders and communities is not undertaken from the start to the end of the process”. 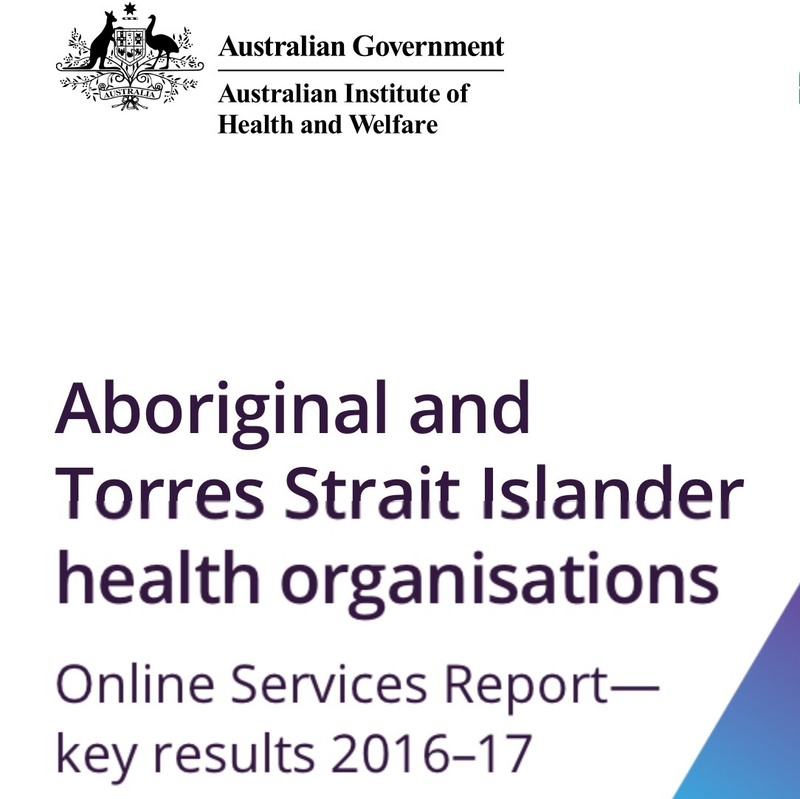 This ninth national report provides information on 266 organisations funded by the Australian Government to deliver health services to Aboriginal and Torres Strait Islander people. These organisations contributed to the 2016–17 Online Services Report. Information is presented on the characteristics of these organisations; the services they provide; client numbers, contacts and episodes of care; staffing levels; and service gaps and challenges. Some changes were made to the 2016–17 data collection, aimed at ensuring consistency in episode of care reporting between the different data collection systems. This resulted in a decrease in primary health episode of care counts in 2016–17. These are not comparable with previous collections, so comparisons are not presented in this report. See Chapter 2 for more information about the data collection, data quality and the impacts of these changes. 196 (74%) provided a range of primary health-care services to around 444,700 clients through 3.2 million episodes of care. Just over two-thirds of these organisations (136) were Aboriginal Community Controlled Health Organisations. Services provided include: health promotion; clinical care; substance-use treatment and prevention; and social and emotional wellbeing support. These organisations also provided access to specialist, allied health and dental services, either on site or by facilitating off-site access. For example, most provided access to cardiologists (90%); renal specialists (87%); ophthalmologists (86%); paediatricians (90%); psychiatrists (87%); diabetes specialists (90%); and ear, nose and throat (ENT) specialists (88%). They also provided access to dental services (94%) and to allied health services such as physiotherapists (89%); psychologists (93%); dieticians (95%); podiatrists (96%); optometrists (94%); and audiologists (91%). Around 7,600 full-time equivalent (FTE) staff were employed by organisations providing primary health-care services and just over half of all staff (53%) were Aboriginal and/or Torres Strait Islander (see Chapter 3). 213 (80%) provided maternal and/or child health services through their primary health and/or New Directions funding. Around 8,400 Indigenous women were seen through 42,200 antenatal visits—an average of 5 visits per client (see Chapter 4). 88 (33%) provided social and emotional wellbeing services. The 189 counsellors in these organisations saw around 16,300 clients, through 77,100 client contacts—an average of 5 contacts per client (see Chapter 5). 80 (30%) provided substance-use services to around 39,400 clients through 197,700 episodes of care. Most episodes of care (88%) were for non-residential or after-care services (see Chapter 6). Nearly half (46%) of the organisations funded to provide primary health-care services to Aboriginal and Torres Strait Islander people did so in Remote or Very remote areas and they saw around 168,100 (38%) clients. Around 44% of employed staff (3,347 FTE) worked in Remote or Very remote areas, including a higher proportion of employed nurses and midwives (59% or 664 FTE) and a lower proportion ofemployed dental care staff (21% or 38 FTE). There were more FTE nurses and midwives per 1,000 clients in Remote (3.5) and Very remote areas (4.4), compared with 2.6 per 1,000 clients overall. There were fewer doctors in Very remote areas (0.9 FTE doctors per 1,000 clients compared with 1.3 overall), perhaps reflecting a greater reliance on nurse-led clinics in these areas. Contacts by nurses and midwives represented half (51%) of all contacts in Very remote areas compared with 29% overall. Over 800,000 episodes of care (25%) were provided to clients in Very remote areas. However, organisations in Very remote areas were still more likely to report staffing vacancies. Nearly one-third (31%) of reported health-staff vacancies were in organisations in Very remote areas. They also had more health-staff vacancies per 1,000 clients (1.0 compared with 0.7 overall). Organisations in Very remote areas were also more likely to report the recruitment, training and support of staff as one of the challenges they faced in providing quality care to clients (75% compared with 67% overall) as well as staff retention and turnover (75% compared with 57% overall). Those funded to provide primary health-care services ran around 8,400 physical activity/healthy weight sessions; 4,300 chronic disease client support sessions; and 3,300 tobacco-use treatment and prevention sessions. Other common health promotion activities included campaigns to encourage immunisation services (in 81% of organisations), healthy lifestyle programs (75%) and sexual health/ education (71%). With respect to maternal and child health services, around 20,300 home visits; 3,100 maternal and baby/child health group sessions; 2,100 parenting group sessions and 1,000 antenatal group sessions were provided. In those funded to provide substance-use services, most (93%) provided community education, while 60% did school visits. Around 4 in 5 (80%) ran physical activity or healthy weight programs and around three-quarters ran tobacco-use treatment and prevention groups (76%), alcohol-misuse treatment and prevention groups (74%), living skills groups (75%), men’s groups (75%) and women’s groups (74%). Most (94%) organisations funded to provide primary health care also provided social and emotional wellbeing or mental health or counselling services, and over half (57%) had mental health promotion activities in 2016–17; however, nearly two-thirds of organisations still reported mental health and social and emotional wellbeing services as a service gap (63%). This was even higher (78%) in organisations funded to provide substance-use services, but not primary health care. Some organisations indicated that clients with high needs had to wait too long for some services, in particular to access dental services and mental health professionals. For example, 50 (27%) organisations providing on-site or off-site access to dental services still felt clients with high needs often had to wait a clinically unacceptable time for dental services. This was higher in organisations in Remote (44%) and Very remote (34%) areas. The Closing the Gap program aimed at reducing indigenous disadvantage has hit stasis 10 years after it began, with four of its seven measures expired, a review of the scheme still months off being completed and warnings from a range of peak organisations that some proposed criteria for replacement targets are irrelevant or unhelpful. Some fear the 11th annual Prime Minister’s report due in February might focus more on ­details of the review and launching a reboot, rather than accounting for any actual achievements in the scheme’s aims. Submissions to the review warn of a “dire need for greater government accountability” and say “a myopic focus on national statistics” in the past has led to the needs of individual remote communities being unmet, as well as criticising the awarding of contracts to mainstream organisations which “frequently lack the capacity, knowledge and cultural competence required to effectively deliver services to our communities”. The National Congress of Australia’s First Peoples has also warned that a focus on “economic prosperity” in the current review “is misguided … and should not serve as an overarching focus for government policy”. It also warns of unhelpful uses of nationwide targets “which, due to data-collection protocols were unmeasurable, and secondly, did not seem to consider the distinct challenges faced at both the state and local levels”. Of the four Closing the Gap targets that expired at the beginning of this month, just one — halving the gap in infant mortality rates — was said to be on track, ­although even that assessment has been questioned. 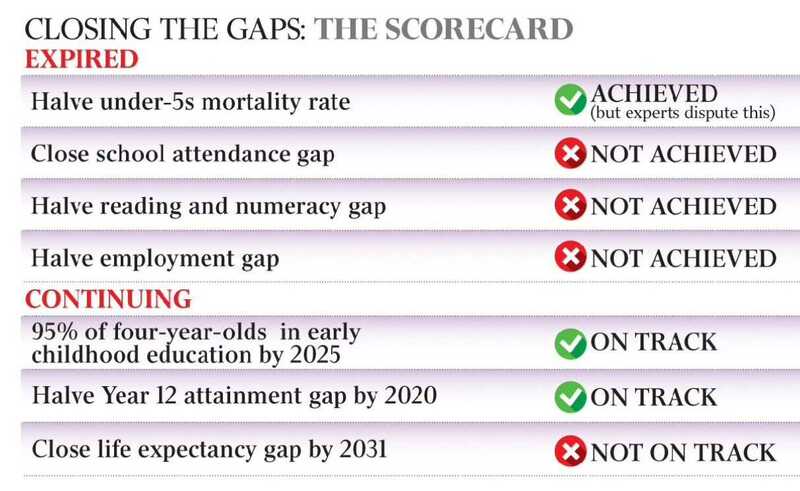 The other three — closing the gap on school attendance, halving the gap in reading and numeracy and halving the employment gap — expired without being on track. Only two of the still active three targets are on track: getting 95 per cent of all indigenous four-year-olds enrolled in early childhood education by 2025 and halving the gap for Year 12 or equivalent attainment by 2020. A third, closing the life expectancy gap by 2031, is not on track. The Weekend Australian understands two review workshops are scheduled in Canberra for the end of this month, for peak groups in the sector and others who have made submissions. The review, which is being conducted by the Department of Prime Minister and Cabinet as a Council of Australian Governments exercise, is then expected to report back by October 31 with a new “framework, targets and performance indicators”. However congress co-chair Rod Little warned this might still be merely a report that requires further refining, with the outcome that by next February, when the Prime Minister’s annual report should be delivered, “that’s one year that’s gone into reshaping the framework rather than working on outcomes”. But he said the October deadline opened the door for further consolidation.